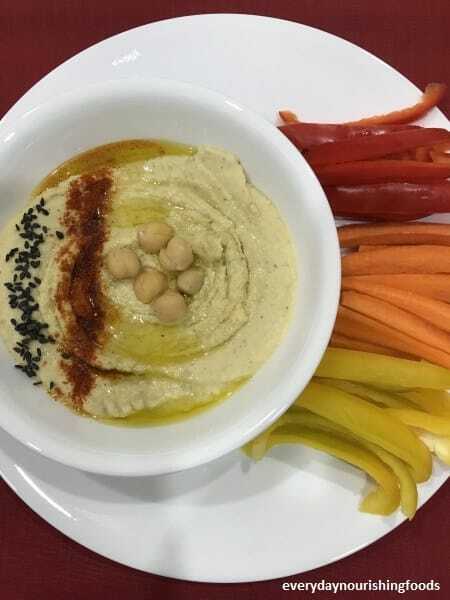 Hummus is a Mediterranean dip or spread made mainly from chickpeas and tahini. Generally, hummus is eaten as a side with pita bread or even with tortillas and crackers. We eat this with jowar roti or whole wheat roti and vegetables like capsicum, carrots, and cucumber. This recipe is very easy to make at home. Chickpeas are the main ingredient in hummus, though it is prepared from a variety of beans. There can be many flavor combinations as well but here I am showing you authentic hummus recipes. Another main ingredient is Tahini, which is basically sesame seeds grounded into a smooth paste without adding any water. I use tahini in smoothies as well. You can find more details about tahini and smoothie recipe here. Generally, avocados, carrots, sundried tomatoes or any greens are added for different flavors. I do add moringa powder( drumstick leaves powder) to this to make it more nutritious. Vegetarians cannot get complete protein from single food. When we combine different grains, legumes, and vegetables, we can easily get all essential and non-essential amino acids. And it’s not necessary to get all types of amino acids at each meal. Just make sure to have a diverse diet of grains, legumes, pulses, nuts, and veggies throughout the day. When any beans or lentils eaten with wheat or rice, makes it complete protein. All our traditional recipes revolve around these combinations. Soak chickpeas overnight or for at least 8 hours. Soaking removes anti-nutrients and makes them easy for digestion. Cook the chickpeas till done. I have used a pressure cooker to do so, the pressure cooker will reduce cooking time. If you are using canned chickpeas, skip above two steps. 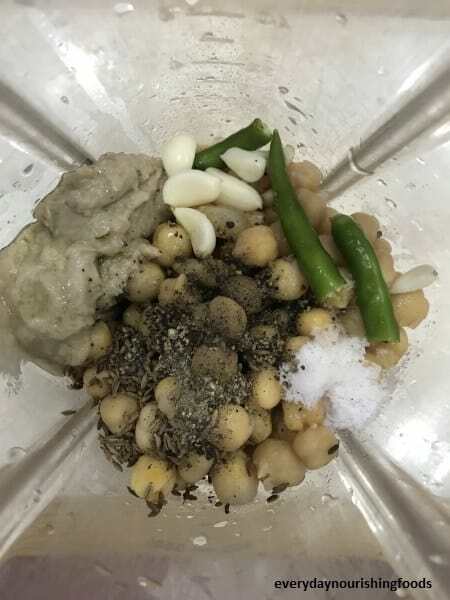 Reserve the cooking liquid of chickpeas and all ingredients into mixer or blender. Make it into a smooth paste. Add reserved water if required. Olive oil gives the smooth texture. As we want the recipe to be a little hot, I use green chili. You can skip it as well. Adjust the smoothness according to your preference. Some people might not like paste consistency.